Posh legends who will now be running the first-team, from left, David Farrell, Grant McCann, Mark Tyler. Photo: Joe Dent/theposh.com. David Farrell believes Peterborough United have appointed a man-management expert as their new first-team boss. 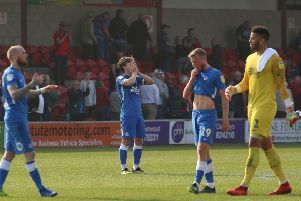 Farrell, who will work as under 21 mananger at the ABAX Stadium in the new regime of club legends, insists Posh couldn’t have employed a better manager than Grant McCann. McCann was handed the managerial reins yesterday (May 16). His promotion from assistant boss made Farrell’s decision to switch from the club’s community department far easier. The pair have worked closely together for all of McCann’s four games as caretaker-manager in the season just finished. Another loyal club servant Mark Tyler will combine his playing duties with coaching the club’s goalkeepers. “Grant didn’t let us in on his thoughts when the manager’s job became available,” Farrell admitted. “But I felt he would be crazy not to apply. He’s perfect for the job in so many ways. “The players respect him and the fans love him. There’s no doubt in my mind that he’s ready. “Claudio Ranieri has shown in the Premier League what a great man manager can achieve and Grant will be brilliant at man management. He already knows the playing squad and he will know how to get the best out of them. “I’m delighted to be able to work closely with him. I dabbled in coaching at Boston when I first stopped playing, but never followed it through. “But now the buzz is back with me and I can’t wait to get started with the under 21s. “Coaching young players is definitely my strength. I will work closely with Grant and with Jack Collison (under 18 manager) to see which players we can develop and improve. Posh will be playing in an under 21 league next season. Their opponents will be revealed before the end of May. Farrell played 391 games for Posh, scoring 55 goals, between 1997 and 2006.